As the season changes from summer to fall, one thing you shouldn’t forget is what the change does to your skin. As temperatures drop so does the humidity and that means drier skin for everyone. One way to combat that is to come up with a new skin care routine that will nourish your skin in the drier months. Pumpkin is the perfect ingredient to start introducing to your skin, especially in the fall. There are five great advantages to using products that contain pumpkin. Perfectly Posh has two great products that are part of this year’s Spooky Posh line that take advantage of all these amazing pumpkin advantages. Disclaimer: I am a Perfectly Posh consultant, any purchases made through the links found in this article will go towards my commission. 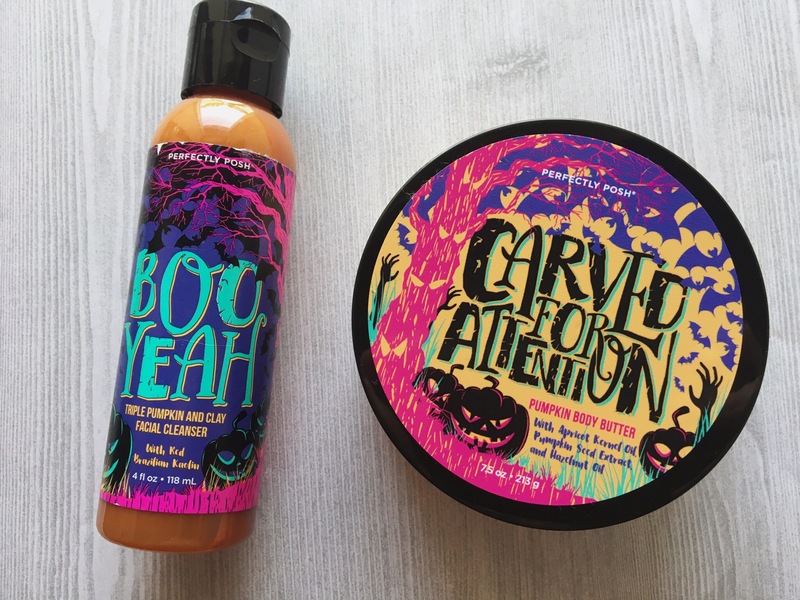 Boo Yeah is a triple pumpkin and clay facial cleanser! You might be asking, how is something triple pumpkin. Well, because it contains pumpkin water, pumpkin extract, and pumpkin seed oil! That means it’s going to help control excess oil your face produces due to the dry weather and help brighten your complexion. It will also help even out your skin tone and give dull, aging skin a nice refreshing look. Meanwhile, the red kaolin clay will give you a mild exfoliation to help remove all the dead skin cells from your face. It also helps draw out debris and reduce the appearance of your pores. Who doesn’t want that?! It has a nice light and refreshing fall scent of sparkling cranberries, but most people have told me that it reminds them of candy! It’s perfect to use day and night! If you’re interested in learning more about Boo Yeah or would like to purchase you can find out more here! Carved For Attention is a thick and hydrating body butter that contains pumpkin seed extract. This has all of the wonderful pumpkin benefits listed above! It also contains apricot kernel and hazelnut oils for a deep hydrating that’s perfect for the fall. The best part about these oils is that they are non greasy so the body butter absorbs quickly and leaves you feeling hydrated without any left over residue on your skin. If you were missing the great pumpkin fragrance in Boo Yeah then this body butter more than makes up for it. It’s sweet and warm, mixing hazelnut and cinnamon that is perfect for those pumpkin spice fanatics out there. If you’re interested in learning more about Carved For Attention or would like to purchase you can find out more here! If you want to learn more about Perfectly Posh and everything else that’s available besides the great Spooky Posh items, then head on over to the website and take a look around. There are some really amazing products to help transform your fall and winter skin care routine. The best part is, they’re all under $25!